The Repetto ballet flat is one of the very few fashion purchases that look as good today as they did 50 years ago . Always in style, the ballet flat is often the perfect choice to wear with a skirt, shorts, capris, a dress or pants when simplicity and comfort are paramount.. The ballet flat has the distinguishing characteristic of being both casual and elegant while most shoes are unable to transcend one category. Buttery soft, the Repetto ballet flat is comfortable and feels like an elegant slipper. 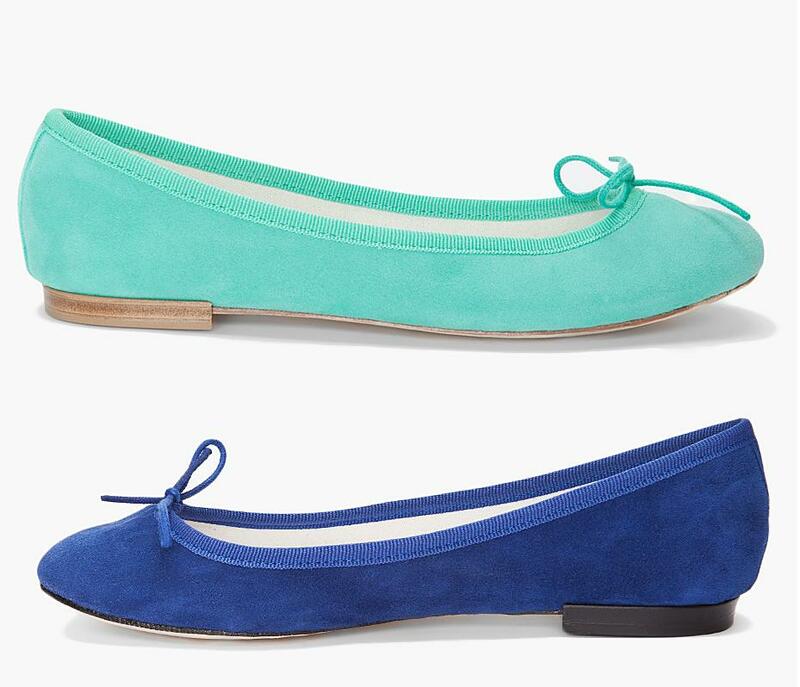 Be forewarned: Repetto ballet flats are addicting. Some women collect shoes by Louboutin or Manolo Blahnik but my choice for luxury shoe collecting is the Repetto ballet flat. Reasonably priced (compared to Louboutin or Blahnik), the Repetto ballet flat typically costs about $245 a pair (the cost varies depending on the material and where the shoes are purchased) – a relative bargain for a high quality shoe that wears well and looks great year after year. The Repetto ballet flat is hard to wear out because the shoe is made exceptionally well so although less expensive ballet flats are available, they won’t hold up like a Repetto. In 1947, Rose Repetto created her first ballet pointe shoes in a small room near the Paris Opera House for the professional dancers. By 1959, there was sufficient demand for her ballet shoes to warrant the opening of a shop at 22 Rue de la Paix (which is still open and considered the company’s flagship store) in the 2éme. In 1956, Madame Repetto started manufacturing the walking ballet flat – a round toed shoe with a grosgrain trim, a small thin bow tie, and a tiny heel – which became a fashion staple. Fifty years later, the quintessential French ballet flat is still manufactured by hand and machine in Dordogne, France to ensure quality standards. The Repetto ballet flat is known as the “ballerine” in French (or “BB” for short for my favorite style but there is also the Cendrillon which is equally as nice) and is made in a variety of colors and materials. The classic ballerine is made in supple lambskin but the flat is also made in flannel, patent leather, python, suede, linen, silk, and cotton. The color choices are numerous (with more than 100 colors or color combinations a season) but change with the seasons although the classic colors (black, white, beige) are offered year-round. This past week while in Paris, I could see the Repetto store from a block away: beautifully decorated windows that looked like a magical ballet set of Coppélia with tutus, chiffon, and tiny lights twinkling. I walked through the doors of the flagship store at 22 Rue de la Paix and saw the big round table displaying all the ballet flats in the colors of the rainbow and took in the beautiful surroundings: floor to ceiling cabinets filled with pink ballet pointe shoes, rows upon rows of leotards and tutus, and velvet covered tufts and small chaise lounge couches to sit upon while trying on shoes. The story was busy, as it always is but there were many associates who quickly delivered shoes to customers. The standard ballet flat was 175 Euros ($220) but 12% (part of the VAT) or about $25 is refunded to your credit card when you leave the country so despite the strength of the Euro, a pair of Repettos are less expensive in Paris then in the US (unless found on sale). And, if you happen to be in Paris at the end of June when the sales start (“soldes” in French), the shoes are discounted 20% and more. There is no free-standing Repetto store in the US but the brand is carried in very limited colors by department stores and specialty stores. For a complete list of stores by state and city, go to the Repetto website. Alternatively, Repetto ballet flats can be ordered on-line. Saks carries a wide variety of Repettos on-line (that go on sale quite often) but only carry up to size 41. Repetto ballet flats run small so order a whole size up. Click on the following link to see the size chart Repetto has on their website: www.repetto.com (or click on the “?” to the right of “Shoe Size” when looking at a specific pair on the Repetto website. I typically wear a size 10 or a 41 in European sizes but in Repettos, I need a size 42, which is often difficult to find – except in Paris….another reason to visit the City of Light. Update: 3/2013: Beginning Spring of 2013, Saks is carrying size 42 in the Repetto Ballet Flat. In addition, www.mytheresa.com also carries size 42. Update: 4/2014: Net-a-Porter (www.net-a-porter.com ) carries a selection of Repetto ballet flats, some of which are offered in size 42. Update: 2016: Repetto has opened a flagship store at 400 West Broadway in Soho in New York City. A really great friend gave my daughter a pair of these in red patent. My daughter wore them every chance she got and they still looked great! I should have mentioned they come in children’s sizes, too! Can I get every color in a size 8? I love every single one.